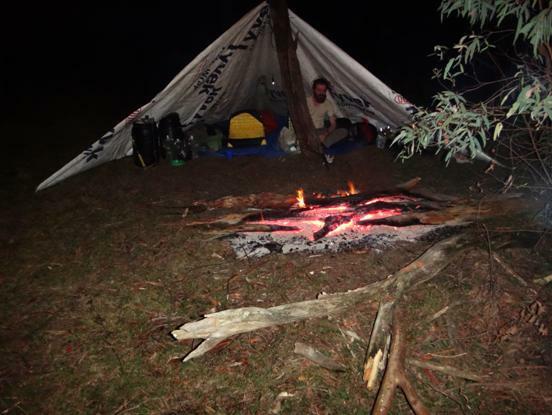 We always camp in an open shelter (something like this) with an open fire out the front. SO warm and cozy even on cold, wet days. This shelter is very easy to make. It consists of a square of Tyvek ‘Homewrap’ (available Bunnings in 30 metre rolls) 8’ x 8’ square. The ‘wings’ consist of another square the same size cut in half. One of these can be cut right off the roll; the other has to be sewn or stuck on (using Tyvek tape). (You end up with an isosceles triangle @ 16′ x 23′ x 16’on which you pitch like this. You can bring the ‘wings’ in towards the tree if rain/wind moves around to that direction – which it almost never does!) The tie-outs are tarp holders from Aussie Disposals.